This was the third long day in a row, driven primarily by the spacing of the campgrounds. Today was much improved though, with the addition of a decent tailwind most of the day. The route gave up all pretense of staying rural as it reached Lake Erie and went through increasingly larger towns. Plenty of traffic too. I really enjoyed this section of the ride though with its views of the lake though the trees; kind of like riding along on the ocean back home. It all culminated in the city of Cleveland which is of course a good sized city. The route was quite through the city, first going through neighborhoods, then a nice park with trail and finally over a bridge into the downtown core. From there it dropped fit to the waterfront by the Indians Stadium and then the Rock-n-Roll Hall of Fame. Staying on the waterfront most of the rest of this now hot day the towns began to decrease in size. Finally I made it to the quite small (but still part of a larger region) town of Perry where I left the route and rode to its park right on the Great Lake. Here they have a little campground that once again seems to be mostly seasonal RV-ers. 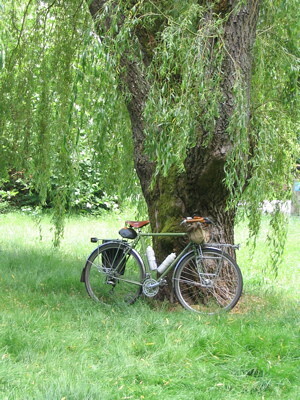 However they are fully up on bicycle tourists and allow them them to stay for free. Nearby to me was a group celebrating a birthday and after plying me with questions w/r/t the tour gave me cake and ice cream. 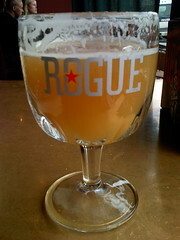 Nice and definitely needed on a day, the first ever on tour, that I rode more than a 100 miles. I’ve been hankering for a long ride for some time now but for various reasons I haven’t been able to get out for a true all day ride. This weekend started off poor with a storm forecasted for Saturday. While never quite reaching storm levels the all day rain wasn’t tempting for an all day ride. Sunday was also supposed to be rainy but waking late to sun streaming in my window seemed to argue to the contrary. Figuring that it was just a sun break before the rain blew in I dawdled, making breakfast and checking email. As 1pm approached it looked like it was going to be a sunny, albeit windy day. The forecast for the day agreed with this assessment adding that there was a chance of rain in the evening. I had been reminded recently of the relatively easy route to Flaming Geyser State Park by this thread over at the Cascade Cycling forums so I hastily printed out the Route sheet and got myself together for the ride. I did need to get some lunch but finding my local sandwich shop backed up with a huge line I rode on into Bellevue. Spotting a Subway by the Whole Foods I grabbed a sandwich and a juice and continued on looking for a spot to eat. Through the city portion of Bellevue and about mile or so before the I-90 bridge I pulled over in a park and ate lunch sitting in the very spot my Atlantis occupies in the photo to the left. Sated I head out into the ride. The day was very windy with it blowing almost directly against me at this point. As I knew I was riding south for a long ways that was a bit depressing but it was otherwise such a nice day I pressed on. The Lake Washington Loop which I was riding into Renton had more then it’s fair share of cyclists, something I’m always happy to see. So many nice days I’m just surprised how few of cyclists you see on the roads. Of course this is a canonical Puget Sound ride and as is more usual I wouldn’t see too many people when I got off signed routes and trails. 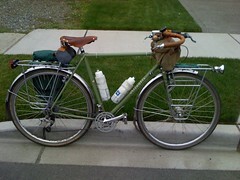 Its about 19 miles from Kirkland to Renton and its a ride I’ve done many times before. 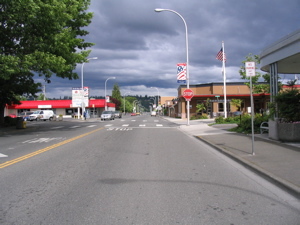 Renton is always a challenge whether you are doing the Lake WA loop, heading out to the Cedar River trail or as in this case riding to the Interurban trail. I hadn’t done this trail before and didn’t really know my way through Renton to get to it. It was at this point that I checked my cue sheet only to discover that it started at the Green River Trail which was no easier to get to then to ride right to the Interurban. So I pulled out my Seattle Bicycle Map and figured out a route that would work. Of course I had no idea about traffic on these roads but I figured I’d play it by ear. It took some wandering, I probably added a mile or two in this fashion but I eventually made my way to this nice side road that had a bicycle lane on it. Looking over from there I spotted these pipes going under the I-405. These had bicycle tracks and I figured they must be a cut to the path. 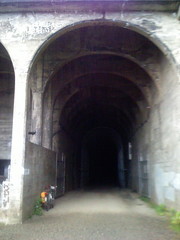 Luckily I was correct in this assumption and walking my bicycle through these two improvised tunnels brought me to what would turn out to be pretty near the start of the Interurban trail. 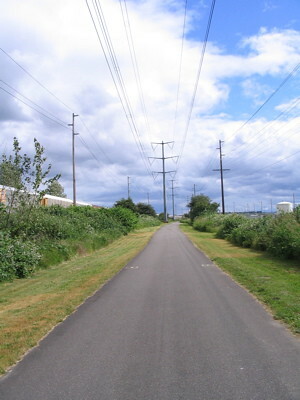 The Interurban Trail is a 14 mile mostly straight, mostly flat trail that runs through light industrial sections of South Puget sound following an old electric rail right of way. It also was heading pretty much directly south which with it’s unobstructed right of way funneled the Southwesterly wind into a pretty stiff headwind with some serious gusts. Even though it was now late in the afternoon there was a decent amount of people using the trail. None of the congestion you’d see on the Burke-Gillman or Sammamish River Trails on a day like this but its nice to see these trails used. The trail was relentlessly straight, only bending a bit here and there to accommodate river, rail or road crossings. Its a bit over 11 miles from Renton to Auburn on the trail and in the course of it you go through Tukwila and Kent passing the Greenacres Horse track and the Auburn airports. This wind that had been blowing across me this whole time was scudding clouds across the sky some of them of the rain variety. But so far there hadn’t been any rain. However it seemed that all these clouds were pooling up right over the park that was my destination. It was black and ominous to the east and as I hit the intersection with the trail and Main Street in Auburn I had some second thoughts. A few drops of rain at this point also bode poorly for riding into these rain heavy clouds. As I intimated above I haven’t been doing the long rides as much as normal and at this point I was at 31 miles and was feeling it a bit. 31 miles back with maybe some variations would be a nice metric century… I took a look at my route and doing some quick addition it seemed it was only a dozen miles to the Park. Well I couldn’t not do that. So into Auburn I went stopping at a gas station for some calories. Now one of the things people don’t talk much about is that cycling gives you a chance to eat some real crap food. And by crap I mean that sugary, salty, fatty foods that no self respecting person eats under normal conditions. Those cyclists who run on protein bars, gel packs and sports drinks are really missing out. I loaded up on peanuts, cookies and got some batteries for the camera (forgot spare rechargeables alas). A train passed by as I went through town, the Sounder which is a regional commuter train. They had a really nice station in Auburn something I hadn’t seen before. I could definitely see taking the train down sometime. Auburn was a quaint little town that seemed to be a mix of small town America with a bit of a near a big city tourism. Some decent looking little shops and restaurants – all closed of course on a Sunday evening. I wasn’t going to be stopping anyway, fueled as I was by junk food an on a pretty tight schedule. The wind was now at my back and while I knew I’d face it again on the way back from the park it was a relief. The road went straight as a ruler through Auburn took a sharp right onto ‘R Street’ wound around a bit and then it was countryside. Flat roads through farmland and by big country homes. There was some sign of suburbia out here in the form of gated communities but mostly it was farms. The road really was quite flat with only a bump or two at river crossings. I’m a big fan of country riding and love to get out of the city and onto roads like this. The should was good the whole way and there wasn’t much traffic. I imagine on a nicer day there would be more but today was perfect. The wind seemed to be pushing the clouds as well and though they clearly were stack up near the park it seemed like the blue sky was going to make its way out there. With the wind pushing me along I made good time to the park and while the clouds were a bit broken up, it just seemed they couldn’t get over the foothills and were lingering. It had clearly rained earlier with everything wet and clean, but so far it held off. Flaming Geyser State Park is a lot more exciting sounding then the reality proves out. Oh there once was a geyser of methane gas that could generate fifteen foot high spouts of fire but these hadn’t burned since 1922. The remnants of this was a capped depression in the ground that wasn’t much to look at. A bit up a trail from the “flaming” geyser was Bubbling Geyser which true to its name bubbled out gray sulfurous ash into the nearby stream. Not too impressive to anyone who has visited Yellowstone, Glacier or other places with more active features. Still the park borders the Green River and was very popular with fisherman who I say casting their flies in many different sections along the river. It was around 6pm now and I knew I’d be heading home in the dark. I had ridden 45.75 miles to the park and I knew I had all that to cover, plus a few extra if I wanted to complete the century ride. But I need a break so I spent some time at the park checking out the trails, the Geysers and the River. But I felt time pressing on me so it wasn’t too long that I used the facilities, refilled my water bottles with faintly sulfurous water and headed back out. More clouds had rolled in and now I was facing that headwind. 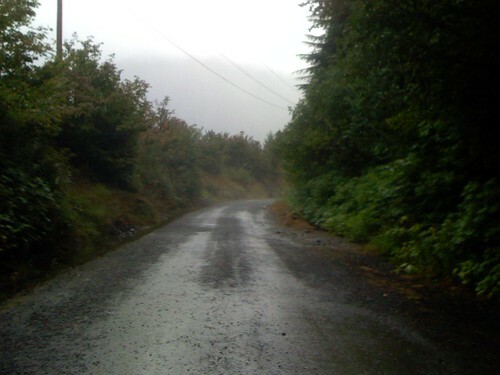 As I rode back up the Green River valley I was misted by rain which became a thin drizzle. I could see sun ahead and I increased my pace to escape the clouds before it became a real rain. Otherwise the ride up Green Valley road was uneventful until I reached the junction with Auburn-Black Diamond Rd. The one turn on this route and unbelievable I turned the wrong way. From that juncture it is maybe two miles back to Auburn but I was convinced that in my tiredness I had misjudge this so I kept riding. Eventually I pulled out my map and figured out that I was riding toward Black Diamond. This route had not been so flat and even though I kept saying to myself “I don’t remember these descents” I had stupidly pressed on. I figured that I had missed the turnoff to Auburn but that the road would loop around. It was the Auburn Black Diamond road wasn’t it? After I had clocked more miles then I knew it was from Auburn to Flaming Geyser I stopped and checked my map. I had ridden back the way I came though north of Green Valley Road. Seeing a bit of a cutoff that seemed more direct I turned off onto SE Lake Holm Road. It was a straighter shorter route but a lot hillier. A decent amount of climbing and then a crazy, curvy 12% descent down to Auburn-Black Diamond Rd. From there was a few hundred feet to the interesting I had missed before and upon taking the correct one was back in Auburn in 10 minutes. D’oh! Pulling into Auburn I again hit a gas station for some Gatorade, Hostess pie, some peanuts and some non sulfurous water. I’d had cash for this whole ride but my tab here was over US$13.00 dollars so it was on the debit card. I sat outside the gas station and ate the pie and some of the peanuts as I downed maybe half of the Gatorade. As I got up the lady behind the counter waved and shouted I should come in. As I did she said she owed me some money, US$9.00 in fact. “Oh yeah?” I weakly replied. “Didn’t you wonder that that water was ten dollars” she asked. It did seem a little high I admitted. You gotta love that – small town honesty. It was now about 8:15 pm and I knew I was chasing daylight. It was about 32 miles from Auburn back home and on a good day with a known route I could do that in 2 – 2 1/2 hours. 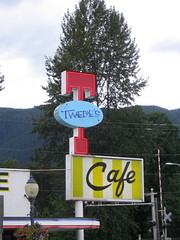 But I’d already ridden 70 miles and I knew that Renton would not be a fast ride through. I hit the trail with the wind on my side and rode. Still a few people on the trail as a beautiful sunset streaked the clouds in the sky with a panoply of colors. I pushed it as much as I could as I knew I’d be limping through Renton and riding the Lake WA loop in the dark which is never fast. I made time up the trail occasionally eating peanuts and drinking my Gatorade (the blue flavor, the only one I can tolerate) and after less then an hour I was in Renton. I rode past that little shortcut I had taken to the trail as I wanted to try to find a route from the end of the trail to the lake. 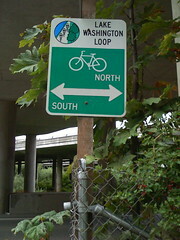 The trail ends right past the 405 and becomes the Green River Trail which heads west. Another one I need to do sometime but not tonight. 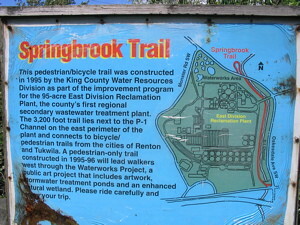 I wandered around this part of Renton and ended up on the Springbrook trail, which ends on Grady road which is the exact route I had taken before. I probably wasted a good half an hour at that point in pitch darkness in Renton. Oh well, I took my chances on Grady road which is a fast four lane road with no shoulder. Not as many cars though as there had been during the day but I pushed it as hard as I could. 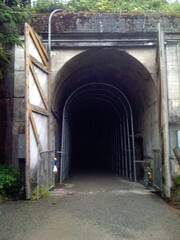 Then it was to the Cedar River Trail and the route through the north end of Renton. Always a pain Renton with no connectors, a canton of trails and ridable roads and in general a hostile attitude toward cyclists. I was happy to be back on the Lake Washington Loop trail after the nightmare of riding through Renton in the dark. Once again my investment in a Schmidt Hub and E6 light had paid off. I am well lit with blinkers on the back but I like have the permanent always available generator powered taillight and a light up front that helps with navigating unfamiliar roads. I like riding at night under the stars on a warm night. It was a bit chill tonight but considering the constant exercise I was in general pretty comfortable. I was burning out but for a whole I felt like I could do this all night. I was running out of water though and was having to ration myself pretty carefully. I was pretty much down to drops by the time I hit Bellevue and was desperately looking for parks. 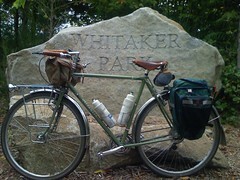 Along the Lk WA loop route is a park billed as Hidden Valley Sports park which had a drinking fountain. Take note, these seem increasingly rare these days. Some water there and a Coffee Crisp I had gotten in Auburn and I was ready for the final 5 miles home. Down into Kirkland then before I reach the waterfront I turn on the bypass up to my place. Climbing the last hill to my house I realize that I definitely couldn’t keep this up all night. I pull into my place at 11 pm at 102 miles.